Elegance and charm don’t go out of style. Just like a hand written note to a friend or a fine letterpress invite to an elegant wedding. Modernism is not synonymous with rashness, rudeness or dismissiveness. Modernism is the price paid by our ancestors and previous civilizations that have brought us to the present high tech life filled with modern comforts. We can still hold a phone in one hand and the door in another for the person behind us. We can be up to date on all the current trends and news while being attentive to a friend’s conversation. Similar to how we conduct ourselves in this fast evolving society, it’s important to write a hand written note, use good stationery for business correspondence and follow traditional sense in writing wedding invitations. This is where Hyegraph Invitations & Calligraphy comes in. Our owner, Jacques Oskanian, is of Armenian decent from Beirut, Lebanon. But he brings with him an old world charm, sophistication and sense of how things used to be growing up in a middle eastern neighborhood where youngsters respected their elders and elders were revered, protected and taken care of. Don’t get me wrong, Jacques is also cutting edge. How else could he have stayed in business for the past 30 years in San Francisco, one of the most most expensive cities in the United States if not the world. I see Jacques’ success stemming, like most entrepreneurs, from his passion. He has a passion that won’t quit. He truly loves his customers and whoever he meets for that fact. I think this is just who he is as a person. He studied and lived in Boston, MA before moving to San Francisco, CA which has been his home for over 30 years. 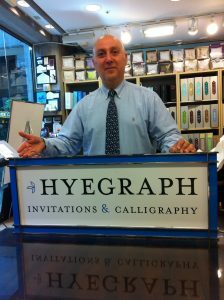 For 30 years, Jacques Oskanian, of Hyegraph invitations & Calligraphy has been serving Bay Area bride and grooms, event planners, socialites, kids planning Bar/Bat Mitzvahs, using his Calligraphy for place card placing people in a particular table at an event, creating creative table names and numbers with themes and colors with his clients. Countless Envelope Addressing with black inks, colors and font styles for companies like the SF Ballet, SF Jazz, SF Opera and alike. This takes passion, love, competence and creates a lot of relationships in the meantime. Relationships are Jacques’ specialty. 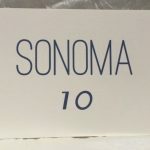 Relationships with Bay Area Hotels and Venues have put him in the Preferred Vendor’s Lists of San Francisco and Bay Area Venues. Relationships with his Bride & Grooms have brought them back with referrals. Relationships with this printers globally have brought them all the way to our store from Massachusetts, India, around California. It’s this access to culture, passion for life, love of people and special relationships that have brought this business owner from a town far away collaborating with distinguished San Franciscans. And who are San Franciscans? When I first moved to town, a native San Franciscan told me I wouldn’t meet many natives. He said most people here are from other parts of the world. I also met a lot of folks that said, when you finally make it to San Francisco you don’t want to go anywhere else. Now, myself being from another beloved town, Boston, wasn’t sure about that since I was too busy being home sick. Looking back, I’ve been here for over 15 years. I realize that because my daughter is 15 and she is a native San Franciscan, as much as a daughter of two immigrants can be. I think immigrants do bring riches from other worlds. They bring the best things with them. They bring with them their stories of how life was in another land. They bring with them their love for this new place. They bring with them many languages, they bring with them many people longing for them. They bring with them their hopes of a better people and a better life. It’s not easy being an immigrant from a distant land. No one has it easy. Even though I was privileged and could count in English, say Thank You and Your Welcome. I and my whole family entered to Boston Logan Airport with our Green Cards. My family was able to buy a house within the first five months of arriving to Boston. I know of a friend who was able to laugh about being smuggled in the trunk of a car from Canada. Another friend came with a travel visa and stayed. I know I was lucky. But still it wasn’t easy for me. I went from being an A student in a private affluent school to not understanding anything the teacher was lecturing. I was at lunch not being able to open a coke can because we had bottled coke where I came from. My patent leather shoes, fur coat, long braided hair and unibrow was something very different for my third grade class. My classmates wore bowl-cut-hair-dos, puffy coats and sneakers. They carried their books in pillow sheets. I wanted to be like them but I wasn’t. I always knew I was from another part of the world. A very ancient part of the world that none of my history teachers would every even point out. I spoke different languages. The world I came from was built on many civilizations. In the morning we had very hot tea, you could smell the tea from your bedroom. Every morning we had warm bread from the baker, who only baked bread. The milk man brought tempest milk and you could actually smell the milk. There was dark black olives, and white cheese on the table. There were the whispers of my parents. There were the sounds of my baby sister and even littler baby brother. Both my grandmothers were in the world I left. My lovely aunts and uncles and my beloved childhood friends who were my cousins. I left them all behind for my father’s dream. This was not a line form a movie for me, this was what my father would say, “One day we will go to America.” Of course, I thought America was a fantasy above the clouds and we would go and smile and laugh there all the time. I did not know it was where I wouldn’t understand my teachers or classmates. Where I was an immigrant, not a native. Where the tea need to be soaked in the cup instead of combined in your cup very carefully. Where bread was stored in the freezer and need to be warmed up. In America I live in an attack for 5 months and in a basement for another. Until we moved into the actual house we owned. Was it worth the humiliation of not being able to read in the class when the teacher called on me, was it worth being apart from my big clan family where I would spend many isolated winter in the bedroom writing to my beloved city. I don’t know. I think maybe it was. But it sure was a high price. Being an immigrant is paying a high price of what might be. Nothing is promised nothing is for sure. But in America you are encouraged to keep your identity, develop your voice and express your thoughts. And I know this is not true of where I came from. So I do think this is the greatest land in the world where each human life is considered sacred and the rights of the individual are protected by the Constitution. Where the best minds in medicine, technology and most other fields meet and discuss and advance. I just don’t want that to change. Because then we would become just like the rest of the world and then where would the dreamers go? I’m not sure why I wrote about immigration while writing about my husband, but it has to do with living in America and we just are immigrants. We’re all from other lands. Many of our clients are from other states and cities here for school or work. They also plan their weddings in their home town like India, Greece, Italy, Hawaii, England, Cape Cod, Napa Valley, Sonoma or just here in San Francisco. The point is we meet and serve so many diverse people but we are just people. 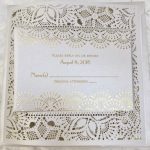 It’s fun hearing about a bride’s dream wedding and a groom’s attention to detail about their wedding stationery, and yes they really do care and men do have good taste, why else would they pick out wonderful brides. And in a time where women need to be strong and tough and go getters and not cry, the reality is women do get tired, feel vulnerable and cry. That’s the way we were designed by the almighty. We are not programmed robots and thank heavens for that. Yes there is a time and place for the wonderful accomplishments and contributions of robots but being human is not being less. If we don’t exist, then what’s the point. The point is, it matters! Everything matters. The little note you receive in the mail box with a pretty stamp from a niece or nephew. The wedding you look forward to attending seeing two people in love and taste exotic foods, music and dancing. These are the rhythms of life. Life is a celebration whether it’s a joyous 1st year or 89th Birthday, a Bar/Bat Mitzvah, a function, gala or wedding, it’s all worth it. So invite, attend, rsvp, eat, drink and dance. Enjoy your life no matter which city or town you live in. Celebrate!